At Sebert Landscaping, propane- and battery-powered equipment are business as usual. 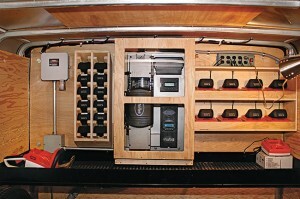 Sebert staff built a trailer to recharge handheld equipment batteries. Sebert Landscaping could be less than two years away from converting its entire mower fleet to propane power. The effort is part of the Bartlett, Ill., company’s goal to eventually end its reliance on gasoline by utilizing some form of alternative energy for all of its equipment, including handheld products. “That means no transfer of gasoline or diesel into gas cans, mowers or handheld equipment,” says Steve Pearce, general manager of Sebert Landscaping. Sebert Landscaping, with estimated annual revenue of $25 million, embarked on a journey about four years ago to reduce its environmental footprint, Pearce says. The company already has swapped out approximately 40 percent of its 150-plus gas-powered mowers for Exmark propane units and has not purchased a gas mower in three years. The switch comes at a premium, with propane mowers costing $800 to $1,000 more per unit, Pearce says. But in the long run, propane should save Sebert money, partly because propane is significantly cheaper than gasoline. Further savings are possible through longer service life, Pearce says. He expects to gain an additional 500 to 800 hours per mower engine with propane units. To refuel the mowers, Sebert’s propane supplier arrives two to three times per week with a propane transfer truck to refill the tanks. The company stocks up to three extra tanks per mower. In the future, Sebert plans to purchase its propane in bulk and refuel its own tanks, which will lead to additional savings, Pearce says. One of the inherent disadvantages of a propane mower is its loss of horsepower. Sebert compensates for that loss by upgrading to 24-hp engines rather than the lower 20-hp engines it would purchase for gas mowers, Pearce says. “So we’re actually seeing no difference in performance when it comes to the mowers,” he says. The company is in the process of studying how fuel efficient the propane-powered mowers are compared to traditional gas mowers. Sebert’s initial study showed a slight increase in fuel consumption with propane, Pearce says. The company also is migrating to battery-powered handheld equipment. 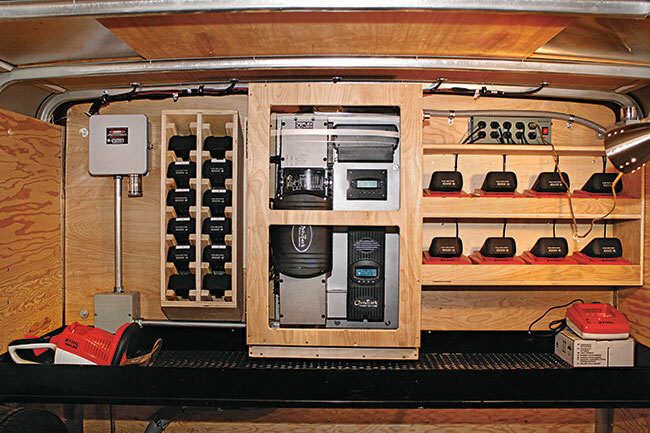 About two-and-a-half years ago company owner Jeff Sebert challenged employees to develop a solar-powered trailer to charge batteries for handheld equipment. Pearce and other employees installed a solar film on top of the trailer that feeds energy through an inverter, which in turn charges a battery-pack system. This setup allows employees to charge batteries continually rather than waiting until the end of the work day. The company recently learned about a development by handheld equipment manufacturer CORE Outdoor Power that could mean eliminating the inverter, which costs about $6,000. With the new system, power would travel from the solar panels to a voltage regulator—costing only a few hundred dollars—to the charger. Moving to battery-powered handheld equipment is a work in progress, Pearce says. The company currently is testing about 25 battery-powered blowers and trimmers from CORE and Stihl. It will be another five years or so before Sebert replaces all of its handheld equipment with battery-powered units, he adds. Performance issues and wide-scale availability are the greatest hurdles. “There has to be industry interest in these pieces for the manufacturers to produce and engineer the equipment that we’re going to expect, and that’s been lagging over the last few years,” Pearce says. The battery-powered handheld units cost approximately 20 percent to 25 percent more than traditional equipment. The units perform as well as gas-powered blowers and trimmers when used for routine maintenance tasks, but they’re less effective in heavier maintenance applications, Pearce says. Manufacturers have rapidly improved the reliability and performance of the machines, and Pearce expects further advancements soon.